XtreemFS is a general purpose storage system and covers most storage needs in a single deployment. 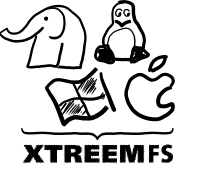 It is open-source, requires no special hardware or kernel modules, and can be mounted on Linux, Windows and OS X.
XtreemFS is easy to setup and administer, and requires you to maintain fewer storage systems. XtreemFS is the only fault-tolerant file system that automatically handles all failure modes — including network splits. Fault-tolerant replication keeps your data safe and gives you peace of mind. XtreemFS scales according to your needs within minutes, simply by adding new standard hardware. 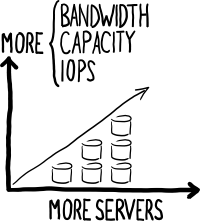 Starting with a single server, growing to a cluster and across datacenters. Be more flexible and protect your investments. and many more use cases, all in a single system.